A drawer specialization intended for the global actions of the application valid regardless of the application state (think about the menubar of a desktop application). Definition at line 63 of file GlobalDrawer.qml. actions: list<Action> The list of actions can be nested having a tree structure. A tree depth bigger than 2 is discouraged. Definition at line 119 of file GlobalDrawer.qml. bannerImageSource: string An image to be used as background for the title and icon for a decorative purpose. Definition at line 82 of file GlobalDrawer.qml. content: list<Item> default property Any random Item can be instantiated inside the drawer and will be displayed underneath the actions list. Definition at line 143 of file GlobalDrawer.qml. Definition at line 200 of file GlobalDrawer.qml. On the actions menu, whenever a leaf action is triggered, the menu will reset to its parent. Definition at line 193 of file GlobalDrawer.qml. showContentWhenCollapsed: bool If true, when the drawer is collapsed as a sidebar, the content items at the bottom will be hidden (default false). Definition at line 176 of file GlobalDrawer.qml. showTopContentWhenCollapsed: bool If true, when the drawer is collapsed as a sidebar, the top content items at the top will be hidden (default false). Definition at line 186 of file GlobalDrawer.qml. Definition at line 69 of file GlobalDrawer.qml. icon: var An icon to be displayed alongside the title. 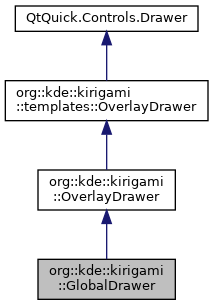 Definition at line 75 of file GlobalDrawer.qml. topContent: list<Item> default property Items that will be instantiated inside the drawer and will be displayed on top of the actions list. Definition at line 166 of file GlobalDrawer.qml. Notifies that the banner has been clicked. Reverts the menu back to its initial state.